Louisa Herle lived alone, with her money and her yipping dog, in what had once been a mansion and had become a shambles. When they found her dead body on Oct. 31st. last, in the shabby, disintegrating brownstone house at 292 12th St., they found, also, cobwebs, and a fortune - and mystery upon mystery. There was the mystery of her death and the mystery of what had happened to her will, if she left a will. And there was the basic mystery of her life. It was a life full of contradictions. They were more or less the contradictions of the wealthy recluse, of the miser. She had been a rich woman for years, and for years before she died, at the age of 82, she lived the skimping life of the poor. She had money, money, money - a fortune somewhere between one million and two - and she was afraid of being robbed. But she kept thousands of dollars in rolls under the kitchen linoleum, in wads stuffed into holes in the walls, in curious, strange places all over the house. The Eagle describes Herle in her later years as a "crotchety," miserly recluse, who slept at all hours of the day and night. It describes a life thwarted and twisted by controlling men, a life which could, in kinder circumstances, have allowed her to be quite "another sort of person." Though the scale of her wealth is remarkable, the tale of her diminished life is not an uncommon one. Herle's father was a baker who came to the States in the 1830's. According to the Eagle article, Jacob Herle became a successful business man; in addition to the bakery business, he also worked in real estate. His story is a stereotypical one of immigrant success. In the early years, life seems to have been harsh, and rigorous. Herle and his wife had nine children, but only three - Louisa and her brothers George and Robert - survived childhood. Little Louisa had scant schooling, and after working for a while "sewing eyes on stuffed dogs," and dressmaking, helped out in the family bakery. But business prospered. Louisa's life became replete with creature comforts, including many fine dresses, and a piano. She was described as an attractive and vivacious young woman. By all accounts Jacob Herle was a controlling father, and forbade her from seeing a suitor she had fallen in love with. After her father's death, her brother George took the reins. The family must by then have moved to their "new mansion" on 12th Street. The house is referred to in another Eagle story as dating back to the Civil War, but that must have been a wooden house, built prior to the brownstone. By the time the "mansion" was built, Louisa, if her given age was correct, must have been in her thirties. George, a confirmed bachelor, thrifty, and disappointed in love, wanted to keep his sister at home as the housekeeper, and quashed the attentions of her subsequent suitors. These included one Robert Schmitt, a retired silver-plater described as "aristocratic" looking. Louisa and Robert became engaged, and Robert's attentions grew amorous. George put a stop to their relationship. None of the three Herle children ever married, and Louisa outlived her brothers. In 1919, when Louisa was in her sixties, Robert Schmitt, still attentive (to her charms or to her money? ), proposed to her again, but she turned him down on account of their advanced age. Or so the story goes. Louisa Herle became a shrewd businesswoman after her brother's death. She studied hard to learn the family business. By the end of her life the bakery was long gone, but she had fat bank accounts and considerable number of real estate holdings. She owned a number of local storefront properties. Initially, at least, she was a sociable woman, friendly with her neighbors, but as she aged, though she maintained some friendships, her life became more solitary, and she grew more fearful of the outside world, worried that she might be attacked or poisoned. She lived in just a couple of rooms in the house; most of it was left abandoned. She skimped on food. Her habits became more eccentric. According to the neighbors (a font of gossipy tidbits) she turned her dresses inside out when cleaning house, to keep the outer sides presentable, but sometimes forgot to turn them right side out again when she went outside. Even in her old age, she still received marriage proposals, but recognized the motives behind them. She turned them all down. She kept her money close, and spent little, when she could, according to the Eagle, have lived "with all the extravagance available to a Prince of Wales." "I should have married him. I loved him but George wouldn't let me. Now it is too late. I always listened to George and wasn't I the fool! Of course George was good to me. He used to treat me once a week - with coffee and cake on Fulton Street." That George - what a guy. It's a mystery though, why Louisa didn't marry Robert Schmitt in later years. Had she grown too cynical, too consumed by avarice to gamble on happiness? Was the chance of a better life gone? We'll never know the answer. Louise Herle was buried in a silver casket, in the family plot at Evergreen Cemetery. The Eagle reported that 100 people attended the funeral. 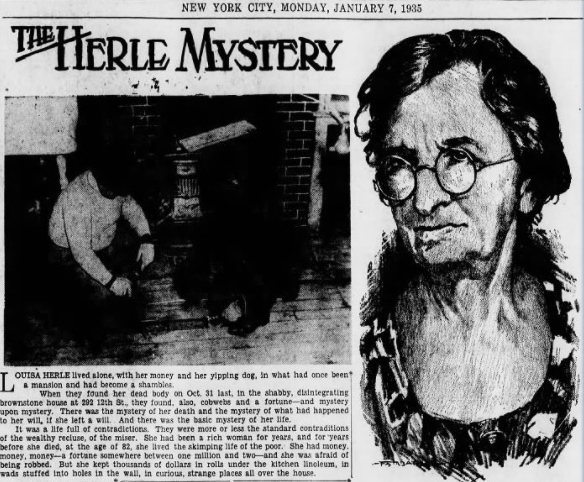 Louisa Herle's death and the mysteries surrounding her will became something of a cause célèbre, in New York and beyond. The Eagle published a number of stories about the house, the money, and the many claims on the fortune. Wealth, death, thwarted romance, a retreat from society - it was all good press. A series of articles covered the search for money in the house on 12th Street. The cause of her death was queried; there were suggestions of foul play. There's plenty of lurid excitement. The house on 12th Street still stands. It looks unremarkable enough, a rare brownstone on a block that is mostly brick and frame. In recent years 292 has looked as shabby as it might have been in Louisa's last years. Or maybe more so. You'd hardly have thought of it as a mansion. For a while it stood empty. It was sold a year ago for almost $2M, and is getting a renovation. As the walls and ceilings were ripped apart, over a century of plaster dust spread in a cloud from the windows and doors. Maybe fragments of currency too. The dust billowed, as if the spirits of the old house were leaving the building too. Are there any faint wisps of the Herles and their successors still lingering there?